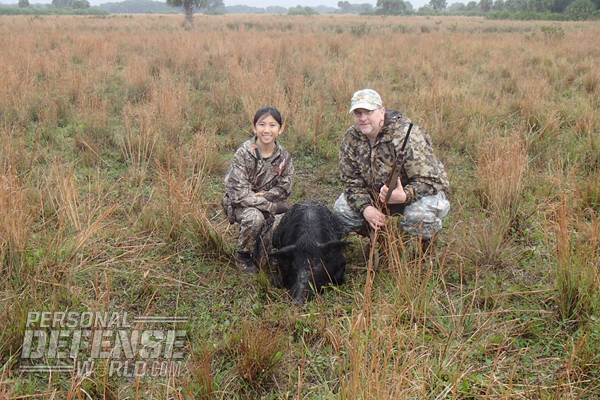 A new hunter brings big trophies during her first boar hunt on a Florida ranch! 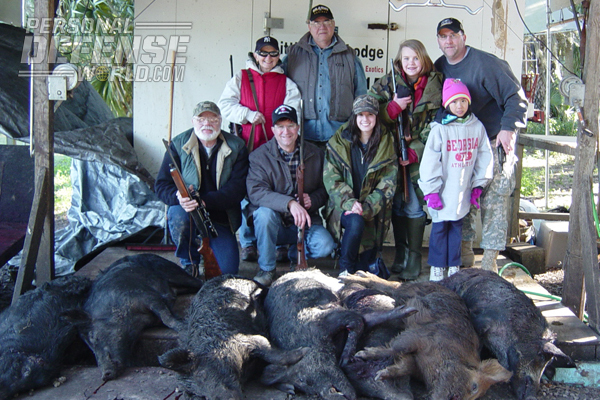 Front row (l-r), author Olivia Vigna with her second boar; John Vigna (father); Sophie Vigna (sister), who took her first boar on this particular trip; and the grandparents Al and Barbara in the back row. For the past five years I have traveled from West Point, New York, to my grandparents home in Inverness, Florida, where they go to escape the hard winters of upstate New York. My family and I always have great times during our holiday visits. But the Christmas of 2009 was very different from the rest. 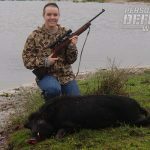 Instead of going to Disney World, Sea World or another Florida attraction we’d already visited, I wanted to go on a hunt. Although my family—father, grandparents, aunts, uncles and cousins—had hunted for generations, I hadn’t hunted before, so I was eager and very nervous. But this wouldn’t be a typical deer hunt. We would be hunting wild boar. I probably didn’t need to practice much more. My grandpa and dad also believed I was ready to move up to the rifle but told me I’d have to go to the range for more practice. I picked up the .44 Mag Ruger and practiced holding it, aiming it, and getting a sight picture with the scope. I realized the rifle was heavier than my BB gun. At the range I realized things would be a lot different than I’d expected. It was an indoor range with several other shooters. I had hearing protection on but could still here the loud noises, feel the concussions and smell the rounds. With all these distractions, I needed to concentrate more when shooting. Then, after shooting several rounds, I found the recoil was a lot stronger than I’d anticipated. I shot at targets from about 20 yards and hit them pretty well. 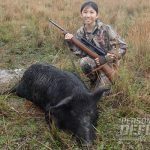 After my morning at the range, the commotion and distractions of other shooters and the scope, I realized that shooting a hunting rifle is no “piece of cake” and requires skill and focus. In the end though, I still felt confident I was ready to go on the boar hunt and was certainly glad for all the practice beforehand. 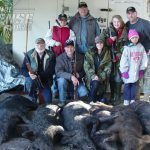 Two days later it was time for the boar hunt. I went with my grandparents, father, uncle, cousin, sister and a family friend. My little sister was too young to hunt, but she came along for the adventure. We woke up at 4:00 a.m. and drove two hours to Lake Okeechobee. It was slightly below freezing. After checking in with the outfitter at the ranch, we were briefed on the hunt and the rules and then signed waivers. Needless to say, by the time we got on the platform vehicle to start the boar hunt, I was keyed up. When we began moving, it hit me that I was really doing this and couldn’t back out. 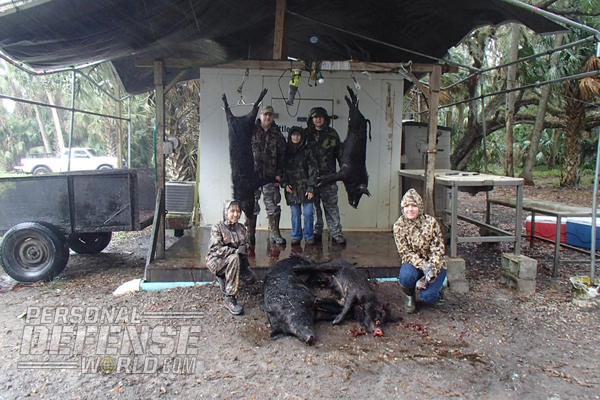 After about an hour, the dogs signaled they had found the first boar. We decided that my cousin would take it. 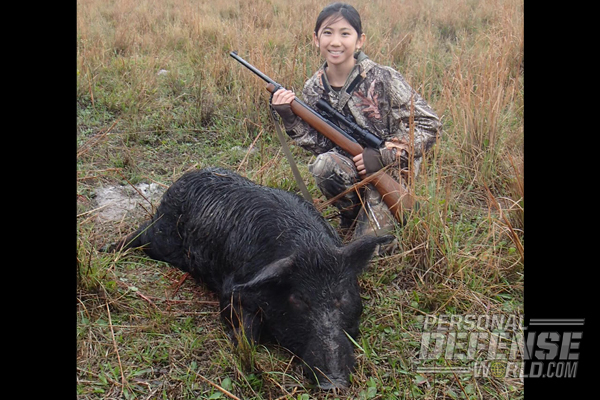 She took a shot from the platform with her rifle and wounded the boar. She and my uncle then got off the vehicle to get a better shot as the boar moved away. 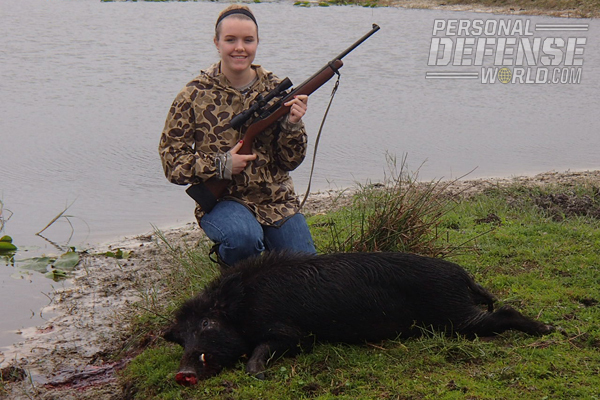 My cousin killed the boar with her second shot. 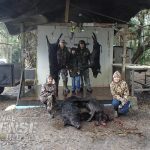 A short time later, at close range and with a .45/.410 Taurus pistol, my father and uncle each shot boars from a group that had run into a palmetto grove. quick prayer and then squeezed the trigger. I watched as the boar fell straight to the ground. I was so happy and couldn’t believe I had killed my first animal with a single shot, and I hadn’t even noticed the loud report or recoil. We climbed down from the buggy and walked to where the boar lay dead in the field. I was ecstatic and looked on with pride. He had tusks and must have been in a lot of fights: both of his ears were chewed off and scarred over. 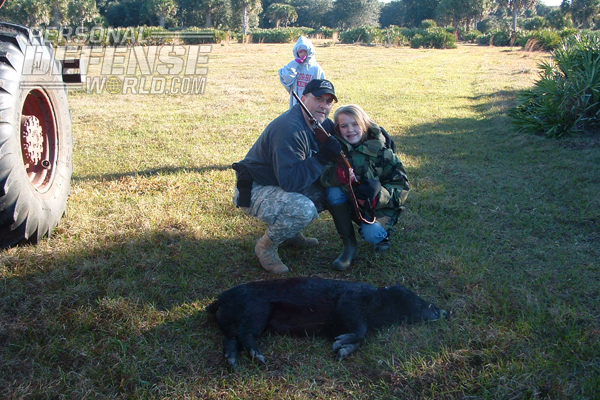 I took some pictures with the boar, then the guides loaded him on the vehicle and we continued the hunt. 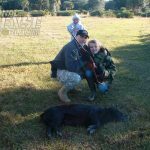 I watched as my grandparents and our friend shot their own boars. 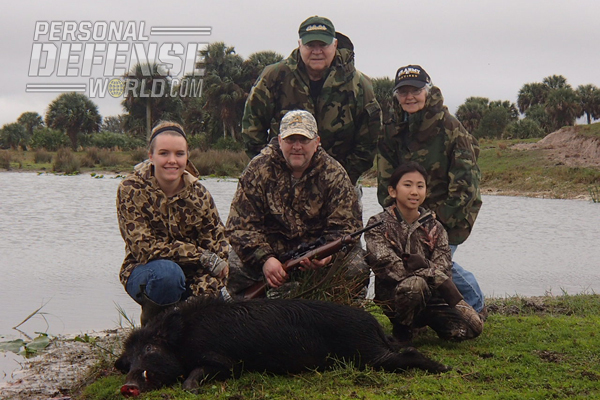 Our hunt ended in success—seven hunters took seven boars. I was overcome with pride that I had killed my first animal and happy for this amazing experience. The excitement of the hunt and of crossing ranchland on the platform vehicle were as much fun as any Disney ride. I decided from that point on that I wanted to hunt and go to the rifle range more. Hunting is a sport that I can do for the rest of my life. 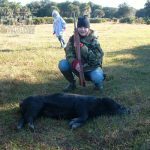 Since then, I’ve taken and passed my hunters certification course, practiced more on the range, and took my first deer and another boar last year.